Words Dance in the NightBallet Book Release Party! for June 14, 2014, in Pittsburgh, Pennsylvania! NightBallet Press editor Dianne Borsenik teams up with Words Dance editor Amanda Oaks for a night of poetry and new books, friendship and fun! NightBallet Press has already published books for three of the poets reading—John Burroughs's The Eater of the Absurd, John Dorsey's White Girl Problems and Fall of the Ramen Empire, and Amanda Oaks's Hurricane Mouth—and is planning to release not one, not two, not three, but five books to celebrate the amazing talent that saturates the Pittsburgh poetry scene! Jason Baldinger's The Studs Terkel Blues! Don't miss out on this chance to see us blow the roof off the Gallery! 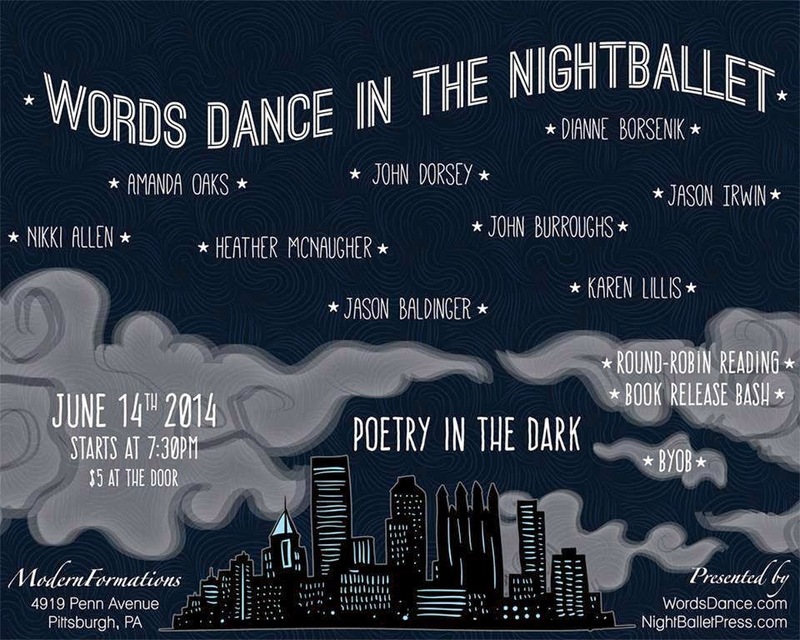 The reading will be "in the dark" but these poets will light up the night with words that sparkle and sizzle...join us, BYOB, and help NightBallet and Words Dance kick off the summer with a night to remember! New May Release: Jerry in the Bardo by Tsaurah Litzky! National Poetry Month never ends here at NightBallet Press! And to prove that we're still celebrating, we've published a brand new book—Jerry in the Bardo—by Tsaurah Litzky! Jerry in the Bardo by Brooklyn, New York poet Tsaurah Litzky is a 32 page book of 22 poems, printed on bright white cotton paper. The textured ivory cover of Jerry in the Bardo features gorgeous collage art by Litzky titled "Jerry Enters the Bardo". (NBP admits we had to look up bardo, which is a Tibetan word meaning "intermediate state"—in Tibetan Buddhism, the bardo is the state of the soul between its death and rebirth.) The colors in the collage are enhanced by a heavy blue-gray cardstock insert. A fascinating character study, Jerry in the Bardo explores the complex relationship between an adult daughter and her aging father, and does so with honesty, sensitivity, and discovery. 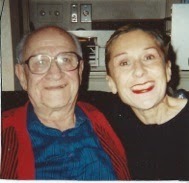 Mostly written, according to Litzky, in the four years before her father Jerry's death on March 7, 2011, Litzky says "Jerry in the Bardo does not offer comforts or platitudes. I only hope its truth comes punching out off the page, the way my father taught me to live my days." Tsaurah Litzky writes poetry, fiction, creative nonfiction, erotica, plays, and commentary, but says "poetry is (her) heart". Her poems have appeared in over ninety publications, including the New York Times and The Outlaw Bible of American Poetry. In 2006, she was named one of the 20 Poets Laureate of New York City by the People's Poetry Gathering. 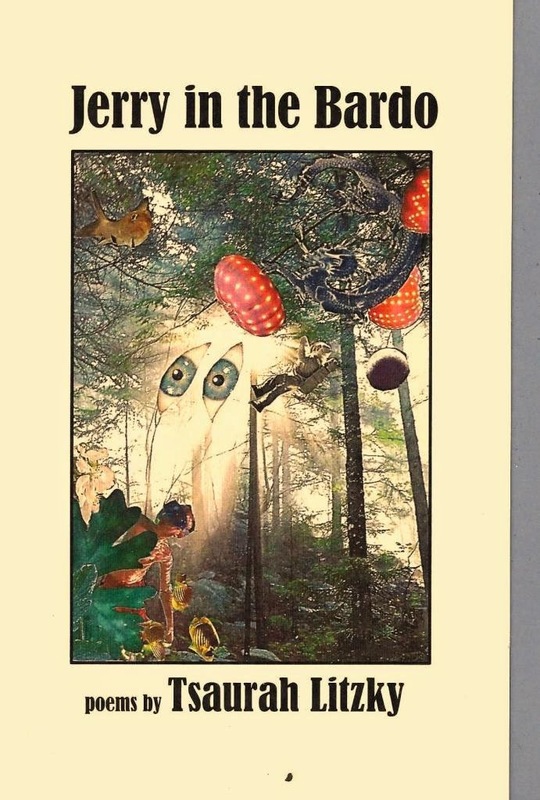 Jerry in the Bardo, selling for $10 plus $3 postage/handling, is available beginning this week of May 6, 2014, right here on the NBP page (see the PayPal box to the right of this posting, on Amazon, and of course, as always, directly from the author!